The Edwards 8000 Series heavy duty backup alarms answers all your needs with its convenient, compact size, rugged housing and high decibel output. The 8001-EG die-cast alarm automatically adjusts its output volume to 10 dB above ambient to compensate for background noise. Range is 87 to 102 dB. 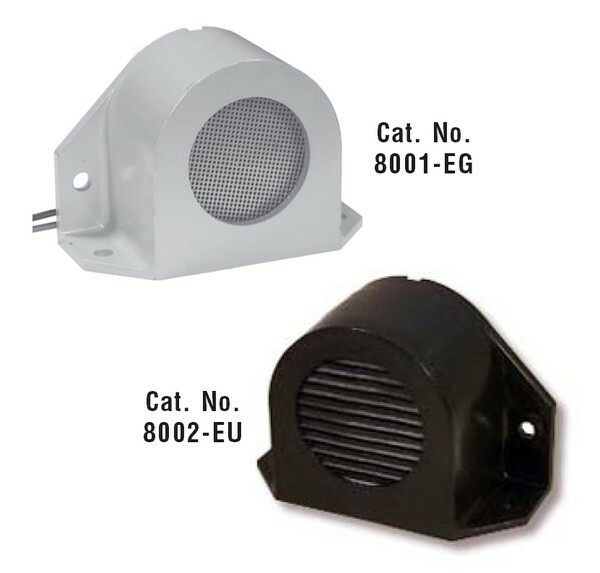 The 8002-EU has an ABS plastic housing and outputs 97 dB. Long Term reliability is ensured as a result of its durable and versatile construction. The alarm mounts in the rear of the vehicle with the sound opening outward into the hazardous area. 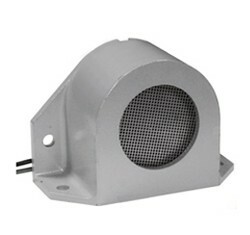 Designed for indoor and outdoor application in a wide variety of vehicles that operated in populated areas. This alarm is perfect for heavy equipment such as forklifts, bulldozers, graders, tractors, dump trucks, and waste disposal vehicles as well as emergency and maintenance vehicles, buses, firetrucks, and general utility vehicles. The Edwards 8000 Series Backup Alarm is an economical life-safety device designed to prevent accidents.